The retailer announced Wednesday that it would cut 2,500 jobs. The axe is falling at Macy's. The department store operator said Wednesday that it was laying off 2,500 workers and closing five stores. The company is also consolidating its regional management and restructuring its retail and merchandise planning staff. "[W]e have identified some specific areas where we can improve our efficiency without compromising our effectiveness in serving the evolving needs of our customers," Macy's CEO Terry Lundgren said in a statement. 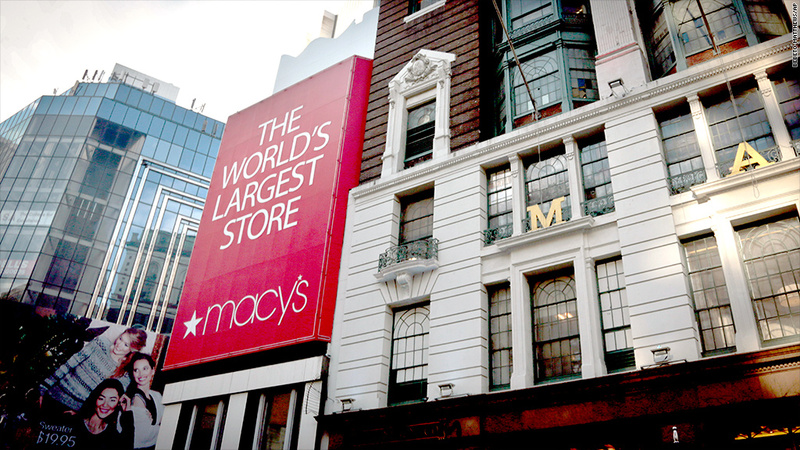 In all, Macy's (M) said it expected the changes to generate savings of $100 million per year. Investors cheered the news, sending Macy's shares up 6.4% in after-hours trading. "The end result is extremely favorable, proactive, what you'd expect from a heads up management such as Macy's," said Bernie Sosnick, an analyst with Gilford Securities. The company, which operates both Macy's and Bloomingdale's, said it expected to employ roughly 175,000 associates in 844 stores following the changes. The firm previously announced eight new locations that remain in the planning or construction stage. The news came on a day when shares of Macy's competitor J.C. Penney (JCP) sank more than 10% after the troubled retailer released a short and vague statement about its sales performance during the key holiday season. J.C. Penney said it was "pleased" with its sales, but failed to release specific figures. The lack of details caused concern among the retailer's investors, who have been betting on progress in the company's turnaround efforts.